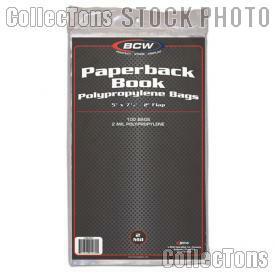 We are pleased to offer for sale these BCW Polypropylene Bags for Paperback Books, pack of 100. The Manga or Reader's Digest Storage Bags are made of completely transparent 2 mil polypropylene. This material is acid-free and archival quality, making these Paperback Book Storage Bags ideal for long term magazine storage. 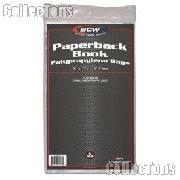 The dimensions of these Paperback Book Storage Bags are 5" x 7 3/8", with a two inch non-adhesive flap for closure. Bags will hold one paperback book.